Liza is determined. As the drum major for her band in a school where music funding is about to get severely cut, she needs to find a way to save the program. Enter the Destiny cruise, where high school performers will be competing for a $25,000 check. Their band must win, and Liza won’t let anything stop them. Not ex-best-friends, not a new love interest, not the weird malfunctioning ship itself. No – the only thing that might get in her way is Liza herself. Let me just say this first: I absolutely adore Lauren Morrill. When I read Meant to Be a couple years back, I was so senselessly delighted by the book that I read through it twice in a row. These aren’t normally the kinds of books I read. They’re a bit silly and a bit predictable and a bit idealized. I can’t help myself, though. This is exactly the sort of book I would have loved to indulge in when I was in high school, and I delight in every word of these books now. Morrill does an amazing job making me forget about my adult brain and my suspension of disbelief and my cynicism. She helps me to just go along for the ride, and root for the characters, and grin and laugh out loud and hug her books by the end. Meant to Be was like that, and The Trouble With Destiny was as well. Both were in settings I’m familiar with – the first, a trip abroad, the second, a cruise ship – and that helped me feel even more connected to the book. Liza, as a main character, is adorably blind and blundering about everything. And of course, you know from the beginning that by the end, everything will work out somehow. 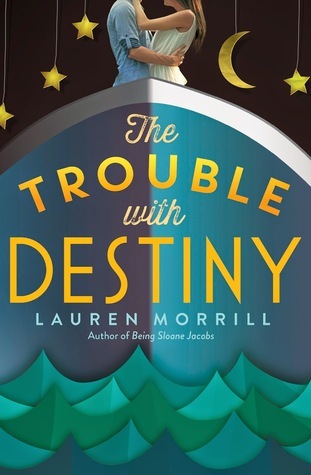 These are feel-good books, greeting-card books, and Destiny was the absolute highlight of my recent Readathon experience. Honestly, I don’t expect these books to work for everyone. They’re sappy and silly and filled with teen hyper-emotions (everything from love to envy to angst), and I know that gets on some people’s nerves. Me, though? I’m just going to keep collecting her books and enjoying myself!! This entry was posted in 2016, Prose, Young Adult and tagged comfort, cruise, favorite, humor, readathon. Bookmark the permalink.